Jacques Daret was an important painter of the 15th century. He trained in the workshop of Robert Campin where he coincided with Rogier van der Weyden, both of whose styles clearly influenced his own work. 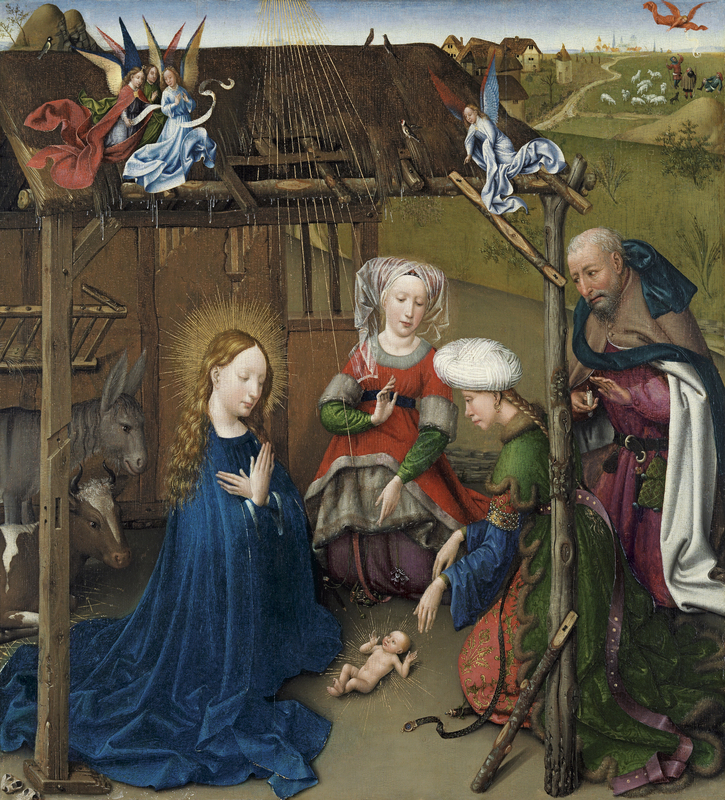 The present Adoration of the Christ Child is notably dependent on a panel of the same subject by Campin now in the Musée des Beaux-Arts in Dijon, both with regard to the figures and the overall composition. The subject is taken from the Apocryphal Gospels of the Nativity, in particular from the Gospel of the Pseudo-Matthew. This text recounts how Joseph went in search of the two midwives to assist the Virgin but by the time they arrived she had already given birth. The midwives entered the cave where the birth had taken place. The first to enter was Zelomi who acknowledged the virginity of Mary, followed by Salome, who doubted the miracle and attempted to verify it for herself. As a punishment, her hands were paralysed. Daret depicts the moment when Salome reaches out to touch the Christ Child, who cured her according to the apocryphal text. The Adoration of the Christ Child was commissioned by Abbot Jean du Clercq for an altarpiece dedicated to the Virgin in his funerary chapel in the abbey of St. Vaast in Arras. Jacques Daret trained with Robert Campin, in whose workshop he is recorded in 1428. In 1432 he is registered in the painters’ guild in Tournai. Daret’s works are heavily indebted to Campin’s both with regard to models and style. In the 1430s he was working in his native city of Tournai and in Arras for the abbey of St.Vaast, more specifically on commission for its abbot, Jean du Clercq, for whom he executed a series of works, among them the present Adoration of the Christ Child. Daret is recorded as working intermittently at the abbey over the course of about twenty years. Among other commissions for Jean du Clercq, Daret executed the polychromy on a series of sculptures. He was also involved in designs for decorations for the Burgundian court and worked on the preparations for the marriage of Charles the Bold to Margaret of York. Before entering the Thyssen-Bornemisza collection the present panel was in London around 1911, then later in New York in the collection of J. Pierpoint Morgan. Between 1924 and 1935 it was in the Pierpoint Morgan Library in New York, entering the Thyssen- Bornemisza collection in 1935. The subject of the panel is taken from the Apocryphal Gospel of the Pseudo-Matthew (chap. 13) which recounts how Joseph installed the Virgin in a cave before the imminent birth then went to finds midwives to help. However, when he returned with the two midwives, Zelomi and Salome, Mary had already given birth. The two women, astonished at the glow emerging from within the cave, remained outside. Zelomi, who arrived first, examined Mary and testified to her virginity. The mistrustful Salome refused to admit the virgin nature of the birth and tried to find proof. As she touched the Virgin, her lack of faith was punished when she was left paralysed. Daret depicts the exact moment when Salome in the foreground stretches out her paralysed hands in order to touch the Infant Christ, following the instructions of a “glowing youth” who, according to the apocryphal text, told Salome that Christ would cure her. This glowing figure is depicted as an angel in white above Joseph. The subject and composition are both derived from a work of the same theme by Robert Campin in the Musée des Beaux-Arts in Dijon. The shape of the stable, the midwives, the group of singing angels on the left and even the angel in white are totally dependent on Campin’s models. Other elements such as the landscape, which is more complex in Campin’s painting, or the figure of Saint Joseph with the candle (an iconography taken from Saint Bridget’s Revelations), are all to be found in Campin’s original. The Christ Child is presented as a source of light, depicted by Daret in the form of golden rays surrounding his body, which lies directly on the ground. This luminous effect, derived from the Apocrypha, was promoted by Saint Bridget, whose text states that the light that emanated from Christ eclipsed that of the rush lamp carried by Saint Joseph (here interpreted as a candle). The Adoration of the Christ Child was part of an altarpiece dedicated to the Virgin in the funerary chapel of abbot Jean du Clercq in the abbey of St.Vaast in Arras. It was commissioned by the abbot himself and was executed between 1433 and 1435. Du Clercq, who was born in Douai in 1376 and died in 1462, was an extremely generous donor to the abbey, which he entered in 1391 and of which he became abbot in 1428. The altarpiece, which included paintings and a sculptural group, had exterior wings, one of which comprised the present panel. 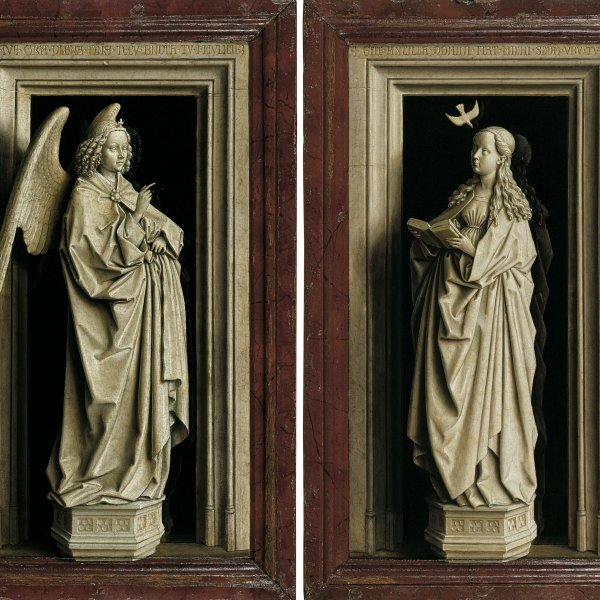 According to a description of the altarpiece by Jean Collard in 1651, these exterior wings also had an Annunciation (lost), a Visitation, an Adoration of the Magi (both Gemäldegalerie, Berlin), and a Presentation in the Temple (Petit Palais, Paris). The altarpiece took the form of a triptych whose central zone was occupied by twelve alabaster sculptures by Collard de Hordain depicting the Apostles, arranged in four niches housing three sculptures each. The composition was completed with a Coronation of the Virgin, a sculpture that the abbot acquired in 1432 from a German merchant. Daret executed the polychromy on the Apostles as well as the decoration of their niches, the architectural framework separating them and the interior framework of the lateral wings. Daret’s paintings were installed on the exterior faces of these wings. The altarpiece remained intact until around 1651 when it was dismantled and dispersed.